TSA Accepted: All YAHEY travel locks are 100% Travel Sentry certified and designed from the ground up to be the strongest and reliable luggage locks in the market. TSA screeners are issued codes and tools for secured access to open the locks. Prevent the Grab and Go Theft : Special high strength alloy lock bodies, hardened steel shackles. keep your personal possessions, like tablets, phones or valuables, safe and secure in many situations. Multipurpose: Can be used on a wide variety of items besides suitcases or luggage. 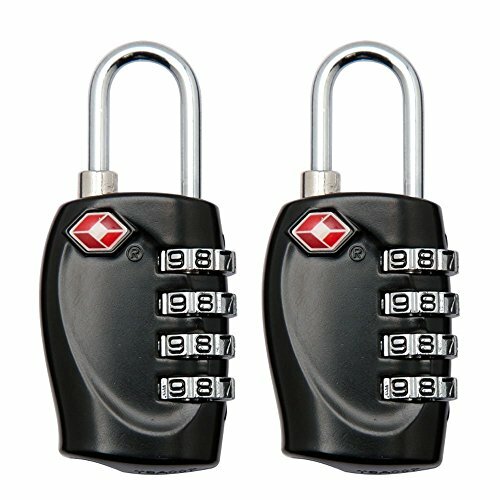 These combination locks can be used on a briefcase, gym locker, purse, backpack or laptop bag，gym, school and Work Lockers. 100% Lifetime Warranty: Each TSA combination lock comes with a 100% lifetime warranty, no questions asked money back guarantee. If you are not completely happy with our product, let us know and we will do everything to make it right!